The thin ice Google and Microsoft were skating in regards to a YouTube app looks to have cracked completely. Hours after news broke that Google blocked Microsoft's two-day-old, re-released YouTube app, David Howard, corporate vice president and deputy general counsel at Microsoft, laid blame for the situation squarely only Google's shoulders. In a biting blog post, Howard singled out Google's call to use HTML5 as the sticking point in collaborating to get Windows Phone customers a YouTube app. He insinuated, however, that there's something more nefarious going on. "It seems to us that Google's reasons for blocking our app are manufactured so that we can't give our users the same experience Android and iPhone users are getting," Howard wrote. "The roadblocks Google has set up are impossible to overcome, and they know it." There's more: "We think it's clear that Google just doesn't want Windows Phone users to have the same experience as Android and Apple users, and that their objections are nothing other than excuses." Microsoft released its own YouTube app in May, however Google objected to the app on several grounds. Microsoft pulled it and the two companies committed to work in tandem to get an app out. An updated application was released on Tuesday, and Microsoft claimed the new version addressed the concerns Google originally raised, including adding advertisements. But the YouTube honeymoon was short lived, and Google disabled Microsoft's YouTube app earlier today. In a statement sent to TechRadar, a YouTube spokesperson said that Google had been working with Microsoft to build a full-feature Windows Phone YouTube app, but one based on HTML5. 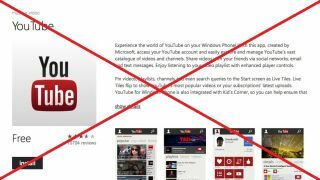 "Unfortunately, Microsoft has not made the browser upgrades necessary to enable a fully-featured YouTube experience, and has instead re-released a YouTube app that violates our Terms of Service," the spokesperson said, thus leading to the app's blockage. In his blog post, titled "The limits of Google's openness," Howard said Google did ask Microsoft to create its app using HTML5. "This was an odd request since neither YouTube's iPhone app nor its Android app are built on HTLM5," Howard wrote. Apps for both systems are generated and supported by Google. After dedicating resources to developing such an app, "experts from both companies recognized that building a YouTube app based on HTLM5 would be technically difficult and time consuming," something Microsoft figured was keeping the iPhone and Android apps from transitioning to the coding language. Ultimately, Microsoft decided to publish its non-HTLM5 YouTube app while committing to work with Google on a long-term basis to create a code-adherent app, Howard explained. He said Microsoft is willing to collaborate with Google on an app based on the code, "but we shouldn't be required to do something that apparently neither iPhone nor Android has successfully figured out how to do." We've asked Google for comment on Howard's post and where the situation stands and will update this story with information as it becomes available. After calling Google's reasons for blocking access "manufactured," Howard addressed several other issues raised regarding the YouTube application. When it comes to ads, Howard claimed that Microsoft's app served Google ads based on metadata made available to the Redmond, Wash. company. Though Microsoft asked Google to provide the same information given to iPhone and Android so it could mirror how ads appear on these platforms, "Google has refused to give this information to us." Branding and a degraded experience were also concerns crowed about by Google, but Howard wrote it's odd for Google to have issues now when Microsoft ran an "inferior YouTube app" before. "Reviews of our new app are unanimous that the experience is much improved, and we're committed to making adjustments to improve it further," he wrote. "If Google were truly concerned about a degraded experience, it would allow our users access to the new YouTube app they love." Still, despite essentially describing Google's behavior as duplicitous, Howard said Microsoft is willing to work with Google to "resolve any legitimate concerns." "In the meantime," Howard concluded, "we once again request that Google stop blocking our YouTube app." It looks like we're in for a long battle, ladies and gentlemen. While we wait for this issue work itself out, why not check out a new Windows Phone 8 device with a 41MP camera?